Sinigang dishes should be exciting. 1. Cook 4kg of meat in 8L of boiling water until tender. 2. 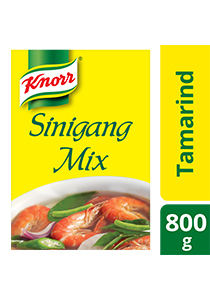 Add 160g (1 pack) of Knorr Sinigang Broth. Add vegetables and simmer until cooked. *For fish meat, include Knorr Sinigang Broth just before the fish gets fully cooked. Tamarind soup base that provides authentic sinigang sour taste.